Author Steven Greenhouse's Rx for better workplaces: tougher enforcement and friendlier policies. "The silver lining — if there is one — in this horrible [financial] crisis is that for years, the country just wasn&apos;t paying attention to how the typical worker was doing," declares New York Times labor and workplace correspondent Steven Greenhouse. "There was so much focus on the wizards of Wall Street and the brilliant entrepreneurs of Silicon Valley, but very, very little attention paid to how the average worker was doing. I think the recession has gotten the nation to realize that things are really bad for millions and millions of average workers." Greenhouse has described that pinch in The Big Squeeze: Tough Times for the American Worker, his chronicle of everything that&apos;s wrong with the modern U.S. workplace: "stagnant wages, worsening benefits, horrible treatment," as he put it in an interview with Miller-McCune.com. "There are a lot of unfair, often illegal things going on in the workplace," says Greenhouse, who also holds a law degree from New York University. Some of the legal violations he details in his new book include forcing employees to work off the clock, union busting and sexual discrimination and harassment. The Big Squeeze has been described by Nobel Prize-winning economist Joseph Stiglitz as "shocking and important"; American Conservative magazine, which would be more likely to be critical of the work, said, "Greenhouse&apos;s picture should unnerve anyone committed to a stable future for American democracy." Although, it added: "Greenhouse can offer only unsatisfactory suggestions for redressing the plight of America&apos;s workers." Relating the accounts of actual people and their experiences working for some of the nation&apos;s best-known companies, Greenhouse doesn&apos;t just round up the usual suspects — although he does devote considerable space to Wal-Mart, writing that "its low wages and benefits have created a downward pull on the way that many companies treat their workers." Broadening his focus beyond low-wage workplaces with relatively low-skilled jobs, Greenhouse — who says he requested the labor-and-workplace beat after a stint covering economic and foreign policy for the Times because he hankered to return to "reporting about flesh-and-blood people" — also details questionable employment practices of firms typically regarded as employee-friendly. Federal courts, for example, have ruled that the FedEx Ground division of the package delivery giant — listed on Fortune&apos;s "100 Best Companies to Work For" — improperly classified drivers (among them a three-time cancer survivor interviewed by Greenhouse) as independent contractors in order to cut costs. Greenhouse also profiles a woman who spent more than a decade working full-time as a so-called temp, "receiving lesser pay, benefits, and status than regular workers," for Hewlett-Packard, a company whose corporate culture, "the HP Way," was once widely celebrated for valuing workers. Some of the other workers he describes in his book toil in what Greenhouse calls a "workplace hell," where store managers for national retailers erase hours from workers&apos; time sheets to cut payroll costs, and a plastics manufacturer&apos;s flouting of safety rules results in four workers losing fingers in little more than a year. Despite such conditions, and the U.S. unemployment rate reaching 9.5 percent in July, Greenhouse cites reasons for optimism — among them, the rising demand for "green jobs." He concedes that green industries may still involve some offshore production: "Solar panels have a lot of complicated electronic guts," he says, so companies "might find it easier to make that in China than here." But many green jobs — installing solar panels, retrofitting houses, erecting wind turbines — will be immune to outsourcing, he says, because they have to be done here. But he&apos;s not content to let most manufacturing move overseas. Greenhouse sees the new emphasis on green jobs as an opportunity to rebuild the moribund U.S. manufacturing sector, pointing to the Spanish wind energy company Gamesa, which is building wind turbines in a formerly shuttered U.S. Steel plant in Bucks County, Pa.
"We as a nation have to get serious about rebuilding our manufacturing sector, because it provides a lot of good middle-class jobs with good wages and good benefits," he declares. Even though two of Detroit&apos;s Big Three are freshly emerged from bankruptcy, he hopes that in the next three to seven years domestic automakers will have narrowed the Japanese lead in hybrid car technology. He also applauds the current administration&apos;s renewed focus on enforcement. "[Labor Secretary] Hilda Solis and the new head of the Wage and Hour Division [Administrator-designate Lorelei Boylan] are very serious about laws being enforced. I think OSHA will become much more serious about enforcement. We&apos;ve had a real 25-, 28-year era of declining regulation under Reagan, the two Bushes and President Clinton, and I think we&apos;ll see more regulation, especially because we see how busted the system is in so many ways right now." 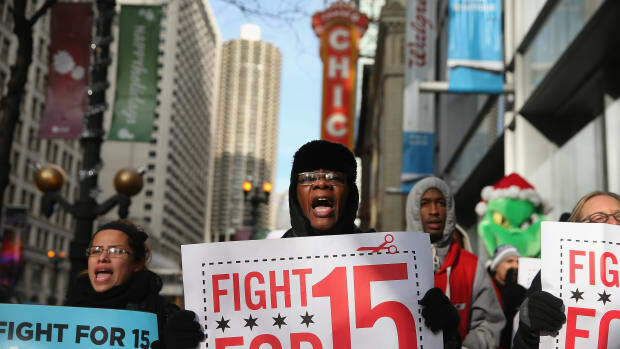 Greenhouse believes that unions can improve the lives of workers, especially those in low-wage industries; he cites Service Employees International Union&apos;s drive to organize 5,000 Houston janitors and the success of the Culinary Workers union in Las Vegas in elevating legions of dishwashers, chambermaids and busboys into the middle class. 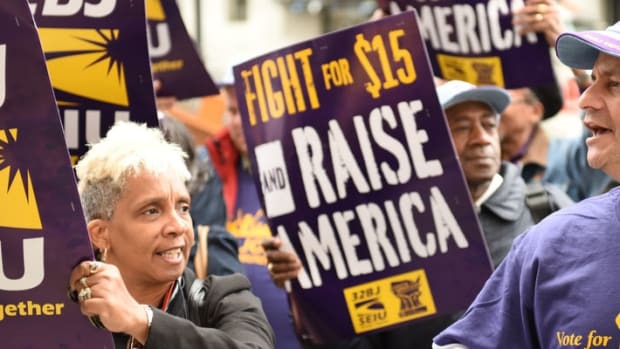 But he forecasts difficulty for organized labor in accomplishing one of its primary legislative goals: passage of the Employee Free Choice Act, the so-called card-check law that would make it easier for unions to organize workplaces by eliminating the need for a secret-ballot vote. "Even top Democrats acknowledge that there aren&apos;t the 60 [Senate] votes to enact that legislation as written," Greenhouse says. "[Iowa Democratic Representative] Tom Harkin is holding intense discussions with many Senate Democrats to figure out what changes or compromises are needed to reach 60. One thing being discussed is to replace card check with fast elections — another idea is to have workers mail in signed cards, the way voters can vote by mail. The idea is that would make it very hard for union organizers to pressure workers to sign pro-union cards." The news from the cubicles, assembly lines and retail aisles isn&apos;t all bad. In his book, Greenhouse profiles several successful companies with benevolent workplace policies. Diverse employers like accounting firm Ernst & Young, shoemaker Timberland and membership warehouse Costco offer employee benefits such as flexible schedules, paid family leave and above-market wages — resulting in low turnover and generally sterling corporate reputations. "A question that&apos;s often asked of me is, &apos;If Costco, [activewear maker] Patagonia and Ernst & Young are doing so well by treating their workers well, why doesn&apos;t everyone do that?&apos; And I say companies have a lot to learn from the Costcos and the Patagonias, but some feel that the low-road route is best for them." He recognizes the difficulties public companies face. "Wall Street investment banks will be somewhat humbled by this crisis, but I still think there may well be just as much pressure as before on companies from Wall Street for maximum profits. ... With the rise of the institutional investor, when companies do not perform well on their profits or stock price, a lot of pressure is brought to bear, more than in other decades, to get profits up, and that often translates into an order to cut costs," frequently resulting in outsourcing and layoffs. "You really saw the shift in the &apos;80s and &apos;90s, where a lot of more aggressive, more cutthroat, cost-cutting CEOs replaced their predecessors because people thought you&apos;ve got to try much harder to maximize share price and maximize profits," he said. Greenhouse cites "Neutron" Jack Welch and "Chainsaw" Al Dunlap as exemplars of this CEO model, men who earned their monikers for laying off thousands of workers (at GE and Scott Paper, respectively) and jettisoning the existing notion of corporate loyalty. But the relentless drive to cut costs may hurt consumers even as it lowers prices. Asked about the recent National Transportation Safety Board hearings into the fatal February crash of a commuter plane near Buffalo that revealed regional carrier Colgan Air&apos;s low wages, poor working conditions and failure to enforce its own policies (for example, against pilots sleeping in airport crew lounges), Greenhouse agreed that "Wal-Martization" has come to the airline industry. "Clearly an important reason that the major airlines have subcontracted with commuter airlines is they know they can set up a lower pay scale for pilots that way," Greenhouse says. He echoes NTSB member Kitty Higgins&apos; contention that, "When you put together the commuting patterns [of the pilots], the pay levels, the fact that the crew rooms aren&apos;t supposed to be used [for sleeping] but are being used — I think it&apos;s a recipe for an accident, and that&apos;s what we have here." For his part, Greenhouse — who describes himself as "one of the few remaining full-time labor reporters in the country" — knows that the pay and working conditions of retail store managers, assembly line workers, and software testers will never captivate public attention like the exploits of celebutantes and wealthy Wall Street titans. Still, he says, the media and politicians need to start paying real attention to workers, instead of using them as photo opportunities during presidential campaigns. Although Greenhouse faults the Obama administration&apos;s handling of the executive bonus scandal ("I think Geithner and company know they screwed up on AIG but they won&apos;t admit it"), he also sees a positive shift in the administration&apos;s approach to workers. "If you look at what&apos;s happening in Detroit right now, the Obama administration has pushed for a deal that I think is more favorable to the workers — the union — than the Bush administration would have. I&apos;m sure the Bush administration would have favored the bondholders more. But I think Obama&apos;s vision is, you&apos;ve got to do right by the workers. ... There&apos;s been a recalibration, a rebalancing, a refocusing on workers&apos; interests." Companies that rank high in employee satisfaction offer better returns to investors, a business school professor says. In Cleveland, a union wins an outsourcing battle against clothier Hugo Boss, using a combination of innovative strategies and old-fashioned bare knuckles. The economic opportunities found in inner cities should attract private investment, although a nudge from government can overcome traditional inertia.